When Empathy Fails – Kathy J. Marshack, Ph.D.
Bumped into a beguiling, but shifty, stranger? Narcissists, sociopaths, addicts, brain injured, autistics, a vengeful ex, corrupt city officials and greedy neighbors. What do these people have in common? According to Licensed Psychologist, Dr. Kathy Marshack, they all lack empathy. She ought to know. She endured a 12-year perfect storm of divorce, lawsuits, assaults, cyberstalking, false arrests, predatory prosecution, and the loss of her children to parental alienation. Throughout all these experiences she noticed there was a common theme, namely people with Empathy Dysfunction (EmD). Hard-learned lessons on how to stand up for yourself when dealing with people who could literally care less about you. A way to identify those with a dysfunctional lack of empathy using the new Empathy Dysfunction Scale (EmD Scale), so you can shield yourself from the destruction they leave in their wake. Clues you should never ignore for your own safety – like a rotten neighbor, friends who start believing the nasty gossip spread by your ex-partner, or a nagging feeling you’re being watched. Pay attention, it may be because “they” really are out to get you. Warrior training to protect yourself from dangerous people. If you’ve been hurt just once, or maybe too many times to count, by a person with EmD, apply the warrior training in this book, increase your own empathy to a higher level, and reclaim the beautiful life you are meant to live. To receive a complementary copy of a chapter from When Empathy Fails, subscribe to our newsletter below. We’ll give you instructions to get your free download. 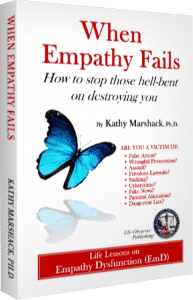 The US~Observer is proud to announce the release of Dr. Kathy Marshack’s latest book, When Empathy Fails: How to stop those hell-bent on destroying you. People get along when they empathize with one another. However, there are those in our society who operate without empathy. They are the people who victimize others; who lie, and cheat, and steal. They are the one’s who take without regard, and live as if they are the end all. Kathy Marshack, Ph.D. knows first-hand the power these types of individuals can have in our lives, and in When Empathy Fails she tells her unbelievable true story. Marshack also shares hard-learned lessons on how you can protect yourself from people who literally care less about you. Furthermore, she introduces the Empathy Dysfunction (EmD) Scale, to help you identify people who have a dysfunctional lack of empathy so you can shield yourself from the destruction they leave in their wake. It takes more than courage to stop unscrupulous people in their tracks; the ultimate protection is to increase your own empathy. If you’ve been hurt just once, or maybe too many times to count, by a person with EmD, apply the warrior training offered in Marshack’s book and reclaim the beautiful life you are meant to live. Previous PostPrevious People with Severe EmD Don’t Have Close Friends – Why Is That?